Today I have another part of the series for our beginners. Today’s article builds on the previous one and reviews the uptrend and downtrend, so called market directions. The market moves in these three directions, but most often it moves to the side, that means is in consolidation. 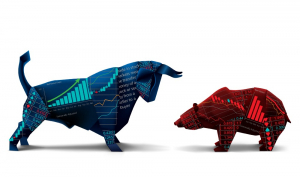 You will also often hear about “bullish” and “bearish” market, what does it mean? The up trending symbol is a bull. Why? Bull attacks by the horns and pushes toreador up. Prices are rising. The down trending symbol is a bear. The bear uses its claws in the attack and thus pushes its victim to the ground. The price of the financial instrument decreases. This is why the growing market is called bullish and the falling one bearish. 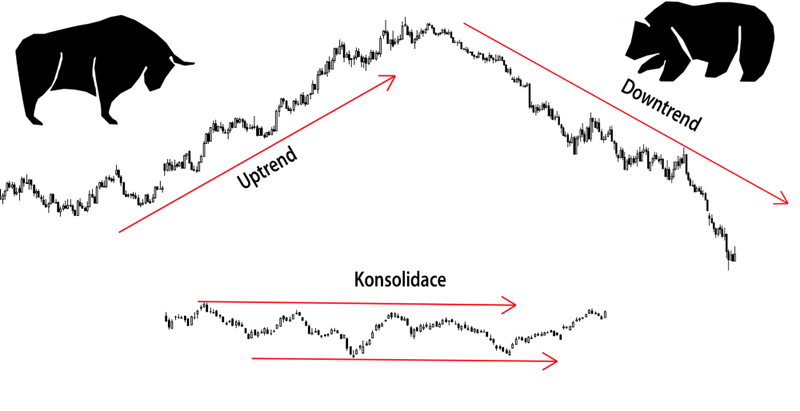 A common scenario is also consolidation, followed by the strong movement up or down. Take a look at the charts, for example, on the online spreadcharts platform, which is free of charge, and you will see that the market is in consolidation before almost every major move. It is a must that will guide you throughout your trading career. You will make most of your money in the trend, not the consolidation.